Forced: After Forest Spider engages a player, it gets 1 Attack until the end of the round. Forced: If Dungeon Jailor is in the staging area after the players have just quested unsuccessfully, shuffle 1 unclaimed objective card from the staging area back into the encounter deck. Only Eagle characters or characters with ranged can attack or defend against Black Forest Bats. Shadow: If this attack is undefended, the damage must be placed on Wilyador. Only Eagle characters or characters with ranged can attack or defend against Mirkwood Flock. Orc Horse Thieves get +1 Attack for each location in the staging area. When Revealed: The first player must choose and discard an attachment from a questing character, if able. Shadow: If this attack is undefended, deal 2 additional shadow cards to attacking enemy. For each excess point of combat damage dealt by Cave-troll (damage that is dealt beyond the remaining hit points of the character damaged by its attack) you must damage another character you control. Immune to ranged damage. No attachments can be played on Great Cave-troll. While Orc Drummer is in the staging area, each enemy gets +X Threat. X is the number of players in the game. When Revealed: Reveal 1 card from the encounter deck and add it to the staging area. Mountain Troll gets +1 Attack for each Mountain location in the staging area. While Crebain is in the staging area, encounter card effects cannot be canceled. Forced: After Wild Bear engages a player, it makes an immediate attack. Forced: When Striking Tentacle attacks, discard the top card of the encounter deck. If that card has a shadow effect or is a Tentacle enemy, this attack is considered undefended. When Revealed: The first player draws 1 card. Then, that player must choose and discard 4 cards from his hand, if able. Forced: After Cave Spider engages a player, that player must choose and discard 1 card from his hand, if able. Rock Adder cannot be attacked unless it has dealt at least 1 damage this round. Shadow: If this attack is undefended, the defending player must discard 1 character he controls from play. Only characters with ranged can attack or defend against Moria Bats. While Moria Bats is engaged with a player, it gets +1 Attack for each other enemy engaged with that player. Players cannot play attachments on Durin's Bane.Durin's Bane cannot leave the staging area, is considered to be engaged with each player whose threat is 1 or greater, and attacks each of those players in turn during the combat phase (deal and discard a new shadow card each attack). When Revealed: If the active location is a Battleground, deal 3 damage to it. Shadow: Deal 2 damage to The Approach if it is in play. Otherwise, attacking enemy gets +2 Attack. When Revealed: The first player deals 2 damage to a questing hero and removes that hero from the quest. Shadow: Defending player raises his threat by X where X is the attacking enemy's Threat. Forced: When Haradrim Elite enters play, it makes an immediate attack from the staging area against the first player. Forced: When the player whose hero has Alcaron's Scroll attached raises his threat, Harbor Thug engages that player. Shadow: Any damage dealt by this attack is dealt to the hero with Alcaron's Scroll attached, if able. No attachments can be attached to Mûmak. Mûmak cannot take more than 3 damage each round. X is the number of different resource icons (Leadership, Tactics, Spirit, or Lore) on heroes in play. Shadow: attacking enemy gets +1 Attack. Deal it another shadow card. Forced: When Orc Rabble is dealt a shadow card, it gets +2 Attack until the end of the phase. Shadow: Deal the attacking enemy an additional shadow card for each player in the game. When Revealed: Deal 1 damage to each Battleground location in play, if able. Shadow: Deal 2 damage to The Citadel if it is in play. Otherwise, attacking enemy gets +2 Attack. While Orc Vanguard is in the staging area, resources cannot be spent from the resource pools of heroes who have a Leadership, Spirit, or Lore resource icon. Shadow: Deal the attacking enemy two additional shadow cards. Forced: When Pickpocket attacks, the defending player discards 1 resource from one of his heroes' resource pools and 1 card at random from his hand. When Revealed: Deal 2 damage to the lowest Threat Battleground location in play, if able. Shadow: Deal 2 damage to The Banks if it is in play. Otherwise, attacking enemy gets +2 Attack. Southron Company gets +2 Threat and +2 Attack while the current quest card has the battle or siege keyword. Underworld Dissident gets +1 Attack for each Underworld location in play. Shadow: If this attack is undefended, remove 1 token from the current quest. Each Wose enemy in the staging area gets +2 Threat. 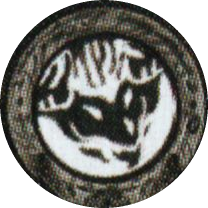 Shadow: Each Wose enemy engaged with the defending player gets +1 Attack. Shadow: Return attacking enemy to the staging area after it attacks unless any player pays 1 resource. X is the number of heroes in play with no resources in their resource pool. X is the number of damage tokens on Dead Villagers. 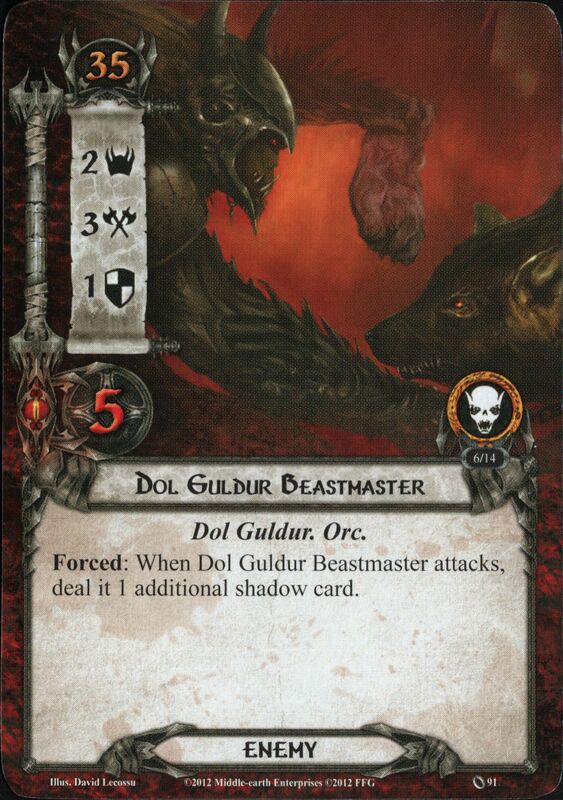 Forced: When Ghulat attacks, place 1 damage token on Dead Villagers. While Ghulat is in play, the game cannot end. When Revealed: Discard 1 villager token from the active location. If no villager token is discarded by this effect, Orc Ravager gains surge. When Revealed: Discard the character with the fewest remaining hit points. That character's controller may discard 3 cards at random from his hand to prevent this effect. Forced: After Orc Ambusher engages you, discard 1 non-objective ally you control, if able. Forced: When Evil Crow engages a player, that player takes 1 hidden card. Shadow: Take 1 hidden card. X is the total number of hidden cards in the game. Forced: At the end of the round, each player must raise his threat by 1 for each hiddien card in his play area. Forced: After any number of progress tokens are placed on To the Tower, deal Morgul Sorcerer a shadow card. Shadow: Defending player must place 1 progress token on To the Tower or treat this attack as undefended. Forced: When Morgul Tracker is optionally engaged, place 1 progress token on To the Tower. Shadow: Attacking enemy gets +1 Attack. If undefended, place 1 progress token on To the Tower as well. Forced: When Methedras Orc attacks, the defending player shuffles 1 random card from his hand into his out-of-play deck. Shadow: If this attack destroys a character, remove 1 time counter from the current quest. Cannot have attachments. Forced: At the beginning of each resource phase, the engaged player must raise his threat by 2. Cannot have attachments. Forced: At the beginning of each resource phase, Angry Huorn attacks the engaged player. When Revealed: Either reveal an additional encounter card, or remove 1 time counter from the current quest. While any player has 3 or more cards in hand, Dunland Prowler gains surge. While any player has 5 or more cards in hand, Dunland Powler gets +1 Threat. While engaged with a player, Dunlending Bandit gets +1 Attack for each card in that player's hand. Shadow: Attacking enemy gets +1 Attack (+2 Attack instead if the defending player has at least 3 cards in his hand). Forced: After Dunland Raider engages a player, that player must deal X damage divided among characters he controls where X equals the number of cards in his hand. When Revealed: Each player draws a card. Forced: After a player draws any number of cards, Dunland Tribesman gets +1 Threat until the end of the round. Forced: After Dunland Chieftain engages a player, discard X cards from the top of the encounter deck where X is the number of cards in the engages player's hand. Put the topmost Dunland enemy discarded this way into play engaged with that player. Forced: After the engaged player draws any number of cards. Dunland Berserker makes an immediate attack. While engaged with a player, Prowling Wolf gets +1 Attack for each location in the staging area. Cannot have attachments. Cannot leave play. Chief Turch engages the first player. Forced: After an enemy engages a player, remove 1 time counter from the current quest. Shadow: Attacking enemy gets +1 Attack for each shadow card on it. Cannot have non-Key attachments. Forced: After the last time counter is removed from Boar's Guardian, the engaged player must discard an ally he controls. Place 2 time counters on Boar's Guardian. Cannot have non-Key attachments. Forced: After the last time counter is removed from Wolf's Guardian, it makes an immediate attack against the engaged player. Place 3 time counters on Wolf's Guardian. Cannot have attachments. Spirit of the Wild gets +1 Threat and +1 Attack for each Key objectives the players control. Shadow: Attacking enemy gets +1 Attack for each Key objective the players control. Forced: When Spy from Modor attacks, remove 1 time counter from the current quest. Cannot have attachments. Ancient Marsh-dweller gets +1 Threat and +1 Attack for each resource token on it. Forced: After any number of time counters are removed from the current quest, place a resource token here. Cannot have attachments. Forced: After any number of time counters are removed from the current quest, Giant Swamp Adder attacks the engaged player. Forced: After Prowling Orc attacks, place 1 damage on the active location. Scour: Prowling Orc engages the player with the highest threat and makes an immediate attack. Cannot have attachments. While Raven Chief's Camp is in play, Raven Chief cannot be damaged. Forced: When Raven Chief attacks, remove 1 time counter from the active location, if able. Forced: After Raven Warrior engages a player. remove X time counters from locations in play. X is the number of cards in engaged player's hand. When Revealed: Either remove 1 time counter from the active location, or reveal an additional encounter card. Shadow: Attacking enemy gets +X Attack, where X is the Time X value on the active location. Cannot have attachments. While Orc War Party is in the staging area, enemies in the staging area cannot take damage. The players cannot win the game while Orc War Party is in play. Forced: After Corned Orc engages a player, it makes an immediate attack. Forced: When Baleful Shade attacks, the defending player discards the top card of his deck. If the discarded card is an ally, Baleful Shade gets +2 Attack for this attack. Shadow: Attacking enemy gets +1 Attack. If this attack destroys an ally, return attacking enemy to the staging area. Shadow: Attacking enemy gets +1 Attack for each ally the defending player controls. Forced: After Dead Lord engages you, put the topmost Undead enemy in the discard pile into play engaged with you. Shadow: Attacking enemy gets +1 Attack. If this attack destroys a character, reveal 1 encounter card. When Revealed: Put each copy of Cursed Dead in the discard pile into play in the staging area. Shadow: Attacking enemy gets +1 Attack (+2 Attack instead if there is a copy of the defending character in its owner's discard pile). Carn Dûm gets +1 Threat for each shadow card currently dealt to it. Shadow: Attacking enemy gets +1 Attack for each shadow card currently dealt to it. Forced: After an event card is played, deal 1 shadow card to Werewolf of Angmar. 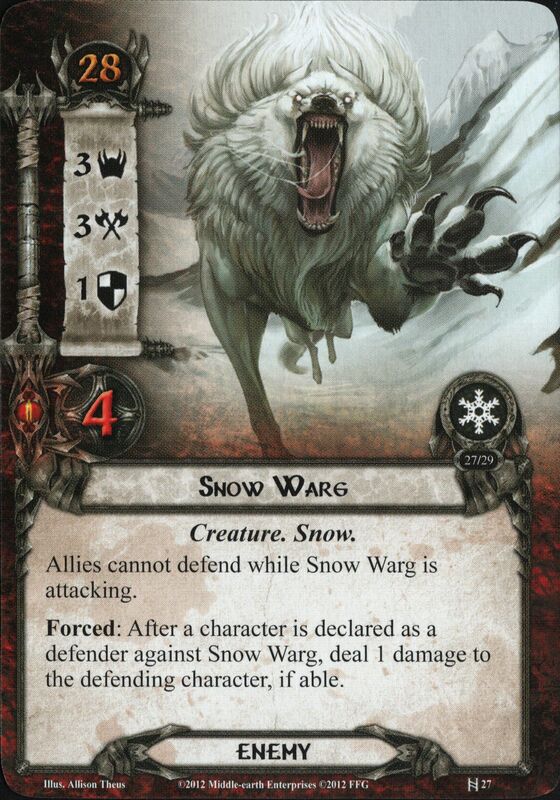 Forced: If there are 3 shadow cards dealt to Werewolf of Angmar and it is in the staging area, it engages the first player and makes an immediate attack (do not deal it a shadow card for this attack). Forced: When Servant of the Deceiver engages you, look at the top card of your deck. If its printed cost is 2 or less, place it on the bottom of your deck and Servant of the Deceiver gets +2 Attack until the end of the round. When Revealed: Either deal 2 damage to an Aflame location in play, or search the encounter deck and discard pile for an Aflame location with the highest Aflame X value, and add it to the staging area. Forced: After Sahír’s Ravager attacks, place 1 resource on it. Then, deal X damage to the Aflame location in play with the lowest Aflame value, where X is the number of resources on Sahír's Ravager. While Southron Sailor is engaged with you, each Ship enemy engaged with you contributes its Threat to the total Threat in the staging area. Cunning Pirate gets +1 Attack and +1 Defense for each resource on it. Forced: When Cunning Pirate engages you, discard an attachment you control and place resources on Cunning Pirate equal to that attachment's printed cost. Forced: When Vicious Marauder engages you, discard a random card from your hand and place resources on it equal to that card’s printed cost. Forced: When Vicious Marauder attacks you, distribute damage among characters you control equal to the number of resources on it. Umbar Raider gets +1 Attack for each resource on it. Forced: After Umbar Raider attacks you, move 1 resource from one of your heroes’ resource pools to Umbar Raider. Forced: When Corsair Infiltrator attacks, deal it 1 additional shadow card for each resource on it. Forced: After the engaged player collects resources at the beginning of the resource phase, that player moves 1 resource from one of his heroes' pools to Corsair Infiltrator. Raid Leader gets +1 Defense for each resource on it. Forced: When Raid Leader engages you, move 1 resource from each of your heroes' resource pools to Raid Leader. Forced: When Drowned Dead attacks and destroys an ally by an attack, place that ally on the bottom of your deck. Shadow: If this attack destroys an ally, place that ally on the bottom of your deck. While you are engaged with Soulless Cadaver, your deck cannot be searched. Forced: When Soulless Cadaver engages you, place each card in your hand with printed cost 2 or less on the bottom of your deck. Forced: When Throngs of Unfaithful is defeated, discard the bottom card of the engaged player's deck. If that card’s printed cost is 2 or less, return Throngs of the Unfaithful to the top of the encounter deck.